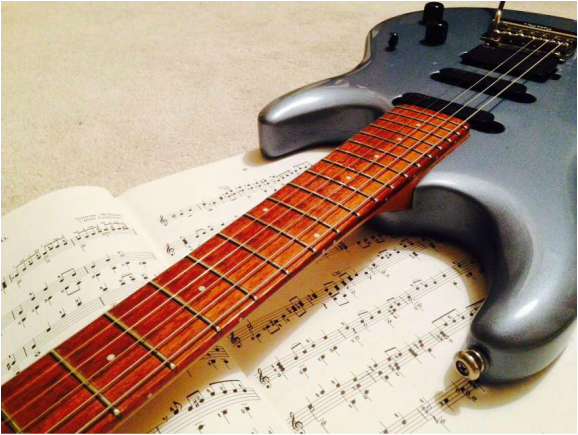 There are many resources available for people who chose to teach themselves to play the guitar. Some people become extremely proficient learning this way. However, the problem for most people, is the lack of structure. One day, you may be learning a few chords, then a pentatonic scale, then you may attempt a sweep picked arpeggio, or some pick harmonics. But do you really know what these things are, how they relate to each other and how, and when to use them? You may even attempt something a bit too advanced, become demoralised and give up altogether. This is why one-to-one lessons with a good teacher, teaching a structured progressive course, is so much better. A teacher will know your strengths and weaknesses, your aims, your rate of progress and will make sure that you learn at your natural speed, setting you material that can be mastered in a reasonable amount of time - which is the way that maximum progress is achieved. A teacher will cover the different elements of learning a musical instrument, the obvious physical discipline, but also timing, ear training and the necessary music theory, and explain how these elements relate to each other. Even if you're learning as a hobby, or for relaxation - which is what most of my pupils are doing - you still want to reach your full potential. So, if you've tried teaching yourself but have become disheartened, then try one-to-one lessons. You'll find this to be much more beneficial than trying to teach yourself to learn in a non structured, fragmented, disorganised way.